After an arduous and challenging period, St Martin is back up on it's feet and with open arms to welcome back past guests to the island. While the recovery for the island will still take considerable time to equal and surpass it's previous standing, we are now confident that guests can enjoy the island to the standard that we come to expect. Starting April 1, 2018, a collection of villas will be available for rent with many other villas becoming available in the following months. We expect the lion share of villas will be ready by November 1, 2018. The island is already welcoming guests. The beaches are beautiful, restaurants have re-opened and the Tuesday carnival in Grand Case has resumed. While repairs are ongoing and the remnants of the hurricane are still visible, the basic essence of St Martin that you came to love with it's exceptional beaches, divine restaurants and warm, friendly people are awaiting your return. We do caution that St Martin will be a diamond in the rough for the near future so we would encourage only previous visitors to visit. 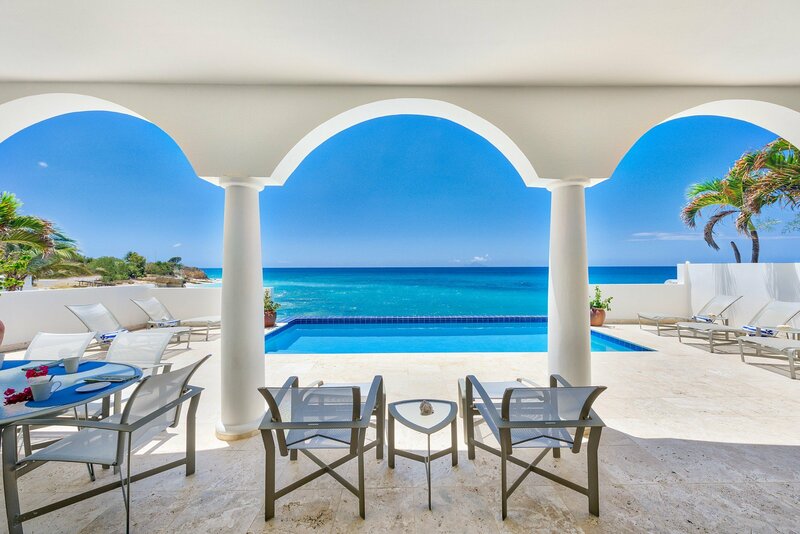 The villas will be in exceptional working order (we will not rent a villa to our guests until the villa achieves the past standard we require) and the service and attention you deserve will welcome you back to St Martin to celebrate it's re-birth. Princess Juliana Airport has been operational. The main building is undergoing repairs and will not be fully ready until March 2019. However, the airport has built air conditioned tent pavilions as temporary terminals. US, Canadian and European airlines have reduced service to the island. We expect them to ramp up flight schedules later this year. Beaches are beautiful and many of the west coast beaches have more sand than in many years. Orient Beach is large and back to it's natural state. There are no beach bar/restaurants operating on Orient Beach for the moment. Friar's Bay, Pinel and Kim Sha beach have popular beach bars that are operating normally. Restaurants are coming back on line. Mario's Bistro is operational and several others in Marigot. The restaurants in Simpson Bay are operating normally. There are several restaurants open in Grand Case and the Lolo's of Grand Case have resumed operation. Supermarkets are open and stocked. All utilities are operating normally. Villas do have internet and satellite TV. Service can be spotty at times as they continue to upgrade the network. The good news is that France has made a large commitment to the island of St Martin and one of the goals is to bring internet speeds equal to European standards. In a few years, St Martin should have the fastest internet in the Caribbean. Security and safety are good. While we fully understand the TV images in the aftermath of the hurricane displayed desperate people in desperate times, the island has ramped up police and security, in turn crime has been minimal. We hope that the images of residents acting inappropriately do not dissuade or tarnish your image of the island. While their actions are not condonable they have been previously neglected in past hurricane aftermaths leading to dire situations. We look forward to welcoming you back to St Martin. Please feel free to contact us today to initiate planning your next St Martin vacation or answer any questions.